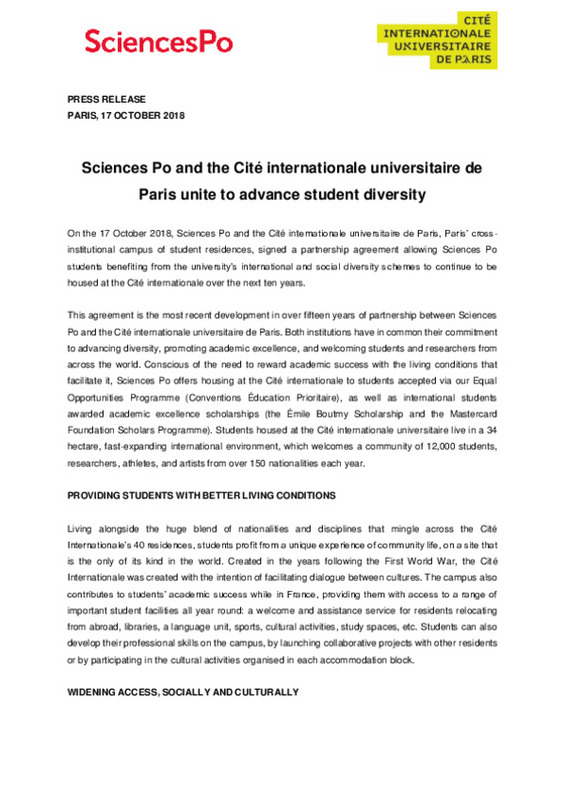 On the 17 October 2018, Sciences Po and the Cité internationale universitaire de Paris, Paris’ cross-institutional campus of student residences, signed a partnership agreement allowing Sciences Po students benefiting from the university’s international and social diversity schemes to continue to be housed at the Cité internationale over the next ten years. This agreement is the most recent development in over fifteen years of partnership between Sciences Po and the Cité internationale universitaire de Paris. Both institutions have in common their commitment to advancing diversity, promoting academic excellence, and welcoming students and researchers from across the world. Conscious of the need to reward academic success with the living conditions that facilitate it, Sciences Po offers housing at the Cité internationale to students accepted via our Equal Opportunities Programme (Conventions Éducation Prioritaire), as well as international students awarded academic excellence scholarships (the Émile Boutmy Scholarship and the Mastercard Foundation Scholars Programme). Students housed at the Cité internationale universitaire live in a 34 hectare, fast-expanding international environment, which welcomes a community of 12,000 students, researchers, athletes, and artists from over 150 nationalities each year. Living alongside the huge blend of nationalities and disciplines that mingle across the Cité Internationale’s 40 residences, students profit from a unique experience of community life, on a site that is the only of its kind in the world. Created in the years following the First World War, the Cité Internationale was created with the intention of facilitating dialogue between cultures. The campus also contributes to students’ academic success while in France, providing them with access to a range of important student facilities all year round: a welcome and assistance service for residents relocating from abroad, libraries, a language unit, sports, cultural activities, study spaces, etc. Students can also develop their professional skills on the campus, by launching collaborative projects with other residents or by participating in the cultural activities organised in each accommodation block. In the early 2000s, Sciences Po decided to act on its observation of the social exclusivity of admission to France’s leading selective institutions. In the hope of diversifying its student body, Sciences Po launched in 2001, under the direction of former Director Richard Descoings, its Equal Opportunities Programme: a recruitment process designed to draw students from disadvantaged high schools in France. With the goal of offering these students the best possible living conditions, Sciences made the decision in 2001 to provide housing to those requesting it at the Cité internationale, an institution sharing its values of excellence and social diversity. The campus agreed to host, by way of derogation from its standard admission rules (license-level derogation), the students of this initiative. A signatory to the Equal Opportunities Agreement, introduced in France in 2001 with the aim of widening access to higher education, the Cité internationale works with leading institutions in France to welcome young people from disadvantaged backgrounds. The partnership also secures housing for international students at Sciences Po awarded the Émile Boutmy scholarship, which was named after the university’s founder. This scholarship is targeted at the most talented students around the world, whatever their social background. Any first-time applicant from outside the European Economic Area, accepted onto either an undergraduate or a Master’s programme at Sciences Po, is eligible for the scholarship. Our programme of “Africa Scholarships”, established in collaboration with the Mastercard Foundation Scholars Programme, will allow 120 gifted African students facing severe financial constraints to pursue their studies at Sciences Po. The welcoming of these talented young people is in line with the admissions policy of the Cité internationale, itself founded on the promotion of academic excellence and social and international diversity.